After supporters of hiking the minimum wage collected enough signatures to put their issue before voters, state legislators approved the increase. It is generally illegal to pay workers less than $9.25 per hour right now, and this threshold will be raised to $12 per hour over the next four years and adjusted for inflation annually after that. When inflation is factored in, this would not be the highest minimum wage the state has ever imposed. That would have been in 1968, when it was 6 percent higher. Supporters of the increase want to help people earning low wages and think minimum wage increases will do the trick. If that is the case, an increase means that more people will be earning the new (and higher) minimum wage. Say that the wage goes up from $8.15 an hour to $10 per hour. The people who had been earning $10 an hour will still be earning the minimum wage, so they are added to the number of workers with a minimum-wage job. Workers who had been earning $8.15 per hour, meanwhile, will now enjoy a higher income. But past experience in Michigan shows that things don’t pan out that way. Between 1995 and 1997, the national minimum wage increased from $4.25 per hour to $5.15 per hour. 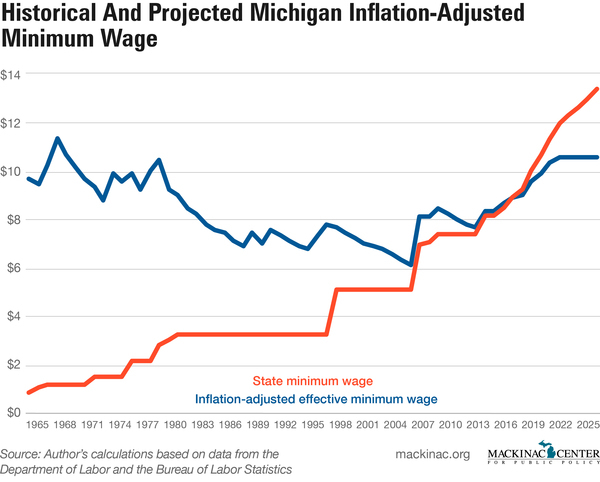 Under the theory espoused by advocates of increasing the wage, the share of workers at or (when exceptions are allowed) below the minimum wage should have gone up. But it did not. Instead, it fell from 7.3 percent of the workforce in 1994 to 6.5 percent in 1997. The decline continued throughout the decade that followed, and by 2007, only 2.17 percent of the workforce was at or below the minimum wage. If raising the minimum wage does not have a large effect on the share of people with low-wage jobs, what does? One thing is the number of jobs that are gained and lost in the economy. The share of people working at or below the minimum wage goes up when the state economy loses jobs, and fewer people work for low pay when the state adds jobs. 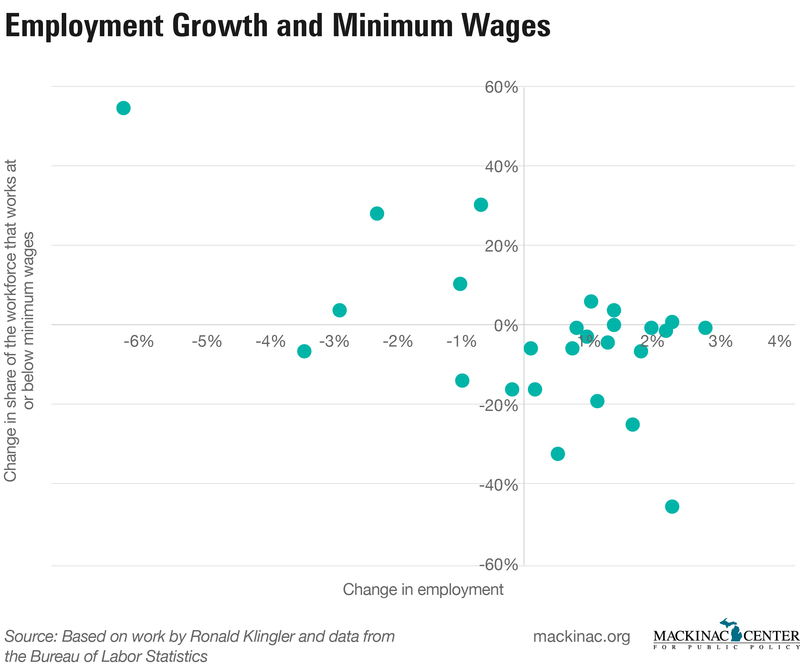 In fact, whether the economy grows or declines has a greater effect on the number of minimum-wage jobs than increases in the wage itself. Job growth helps low-income earners get higher wages, and a recession puts a higher proportion of employees at or below the minimum wage. Large and sudden increases in the minimum wage have the potential to shock the economy and have ripple effects that hurt both low-wage workers and everyone else. Michigan’s increases, however, have been relatively small and gradual, so their effects have not been severe. The increases have done little to get more people working at minimum-wage jobs. The incoming minimum wage hike is unlikely to wreck the economy, but it is probably going to cause some minor harms to it. The decline in minimum-wage jobs after minimum wage hikes indicates that supporters do not get what they want out of the policy. The additional wage mandates more likely result in the elimination of some minimum-wage jobs. Given that the workforce earning that wage is small, the harms will also be small. While minimum wage laws may have little effect on larger economic trends, they matter a great deal to people who work at the low end of the wage scale. When previous wage arrangements become illegal, business managers have to ask whether they will eliminate jobs or raise wages. Under a new wage law, both job losses and wage hikes will happen, which is bad for the people who lose their jobs and good for those who get higher wages. Whether the wage increases are more important than the job losses is a debatable point. But that’s small potatoes. 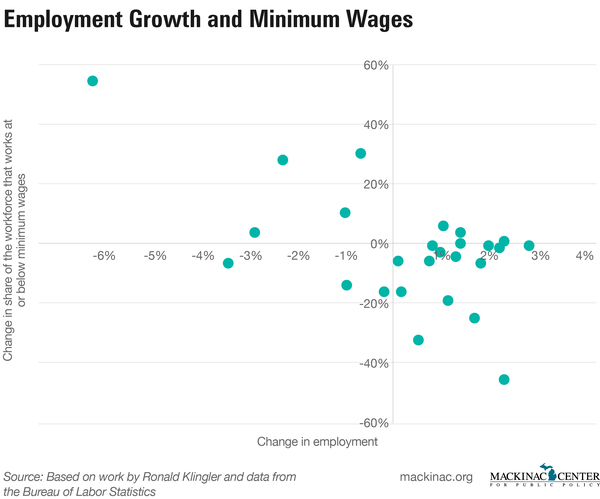 Increases in the minimum wage do little to improve the economy overall. And that is what matters most for low-income workers.